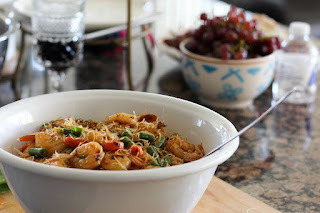 A delicious and easy stir fry using rice noodles, veggies, and either shrimp, chicken, or pork or beef. Soak rice noodles in warm water for 15-30 minutes. Drain completely, and set aside. Heat a large frying pan with 1 tbl. of the oil on high heat. Add shrimp and season with 2 tb of the soy sauce, vinegar, and black pepper. Cook until shrimp are completely done (should be pink and no longer clear). Remove from pan and set aside. Add more oil if necessary and add vegetables. Cook until onions are clear and veggies are crisp on the outside. Add shrimp back in the pan and then add rice noodles, mixing everything together. Add remainder of soy sauce, additional black pepper if needed, and the rest of the oil. Cook on high heat and mix noodles with veggies and shrimp, until noodles are tender. Serve with a side of lemon and green onion! We have all the ingredients in shop to make this spectacular dish! See you soon! Lots of new shipments of goods just arrived for the New Year celebration. We are open New Year's Eve until 5pm and Closed Jan 1st and reopen Jan 2nd at 11am-5pm. At our store, we are always trying to come up with a twist on celebrating the holiday festive season. Carrying mainly ethnic foods and ingredients, we tend to fuse [always] ingredients together. For example, stuffing for a turkey or in this case, a whole chicken. 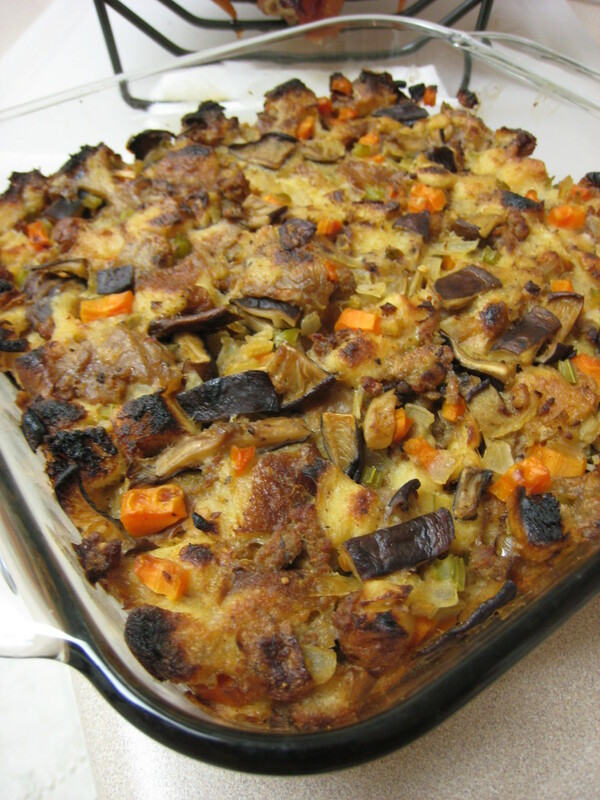 In the past, it has always been the usual stuffing with breadcrumbs and some spices or the random boxed stuffing mix. This year, we have decided to use an ethnic bread, Pan de Sal, which is a Filipino version of bread rolls, for our bread crumbs, and toss that in with some ethnic seasoned meat, longanisa. Longanisa is usually found in a sausage form, here with the stuffing, we will remove the casing and use just the meat. Longanisa has been a staple for the Filipino's, at home and also those living and working abroad. The seasoned meats go pretty fast off our shelves ... BUT we continually keep it well stocked! Especially for the holiday season now! We found an amazing recipe and pictures [since I totally forgot to take some while I was trying out the recipe] from Burnt Lumpia Blog! 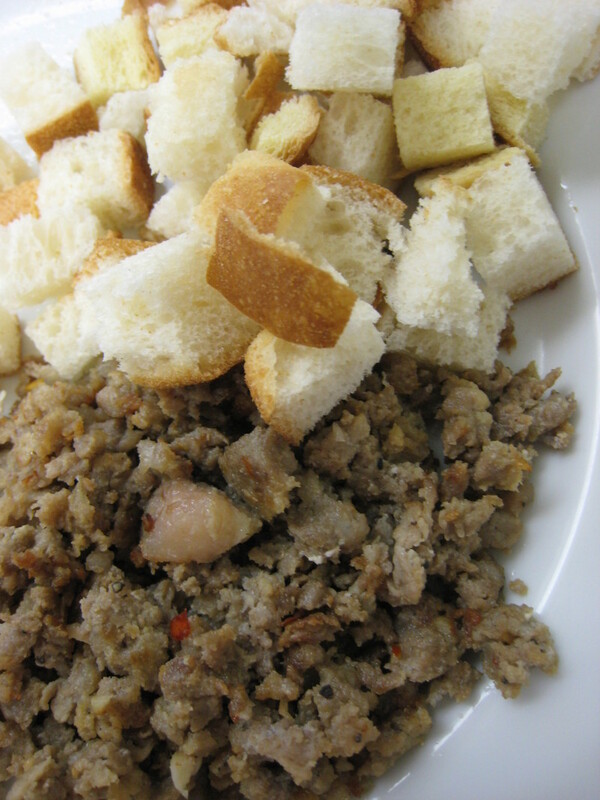 So are you ready to try a different take on your stuffing?!?! Add the pan de sal to a large mixing bowl. Heat the vegetable oil in a large skillet over medium-high heat. Add the longanisa to the pan and cook until golden brown. Using a slotted spoon, remove longanisa from pan and add to mixing bowl with the pan de sal. Add all of the vegetables to the pan and saute until onions become translucent, about 5 minutes. Transfer vegetables to mixing bowl with pan de sal and longanisa. Return saute pan to the heat and add the 1/2 cup of wine to deglaze, making sure to scrape the brown bits from the pan. Turn heat off, and transfer deglazed pan liquid to the mixing bowl. Add the turkey stock to the mixing bowl and gently mix contents (try not to break up the bread cubes). Add the eggs and salt and pepper to the mixing bowl and continue to mix contents until eggs are incorporated, use your hands to mix if necessary. Place the stuffing mixture into a 9x9 baking dish and cover dish with foil. Place baking dish in oven and bake for 1 hour. After an hour, remove foil and continue to bake for 15 minutes or until top of stuffing has browned nicely. serving suggestion by Burnt Lumpia! 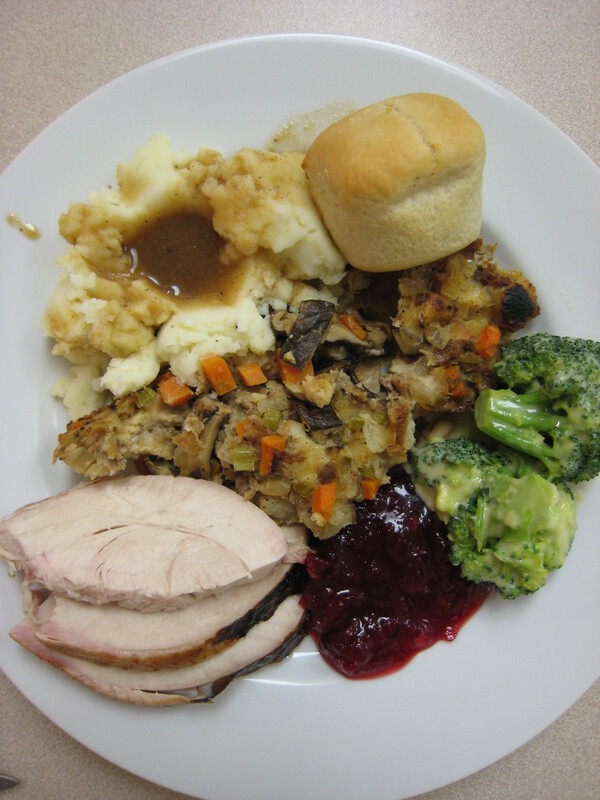 Enjoy and let us know and share with us your stuffing recipes! What would it be like, if all the little goodies, that we create in our lovely kitchen, could be shared with others? What if the scrumptuous homemade pralines, marmelade, cupcakes, or spicemix were to be remarkably decoratively packed for a trip, a few kilometers away, so that it would create happiness for someone?! Our thoughts: It would be amazing! And by paying it forward, by sharing with others, we, at the Asian Supermarket World Foods and Imports, want to create and foster this happiness: The idea to share and to connect us! How it works: Every 3 months, a theme will be announced on our blog. Everyone who would like to create [more] happiness, can register per Email, and you will receive an Exchange Partner at a fixed date. And so, the creation of happiness begins: cook, bake, stir, steam, and what ever your heart desires, snap a photo from your creation and send it away decoratively packed. And please post your photos on your blogs, if you don't have one, send us your photo and we will post it on our blog! And through our happiness creation, we could collect all our photos on Pinterest. Join us in creating happiness? We would love to connect with you! We would like to extend our warm welcome to the ever growing Bhutanese Community in Lethbridge, AB. We have had the fortunate opportunity to carry a selection of food that the Bhutanese have requested and we continue to expand on this, over the past couple of years. 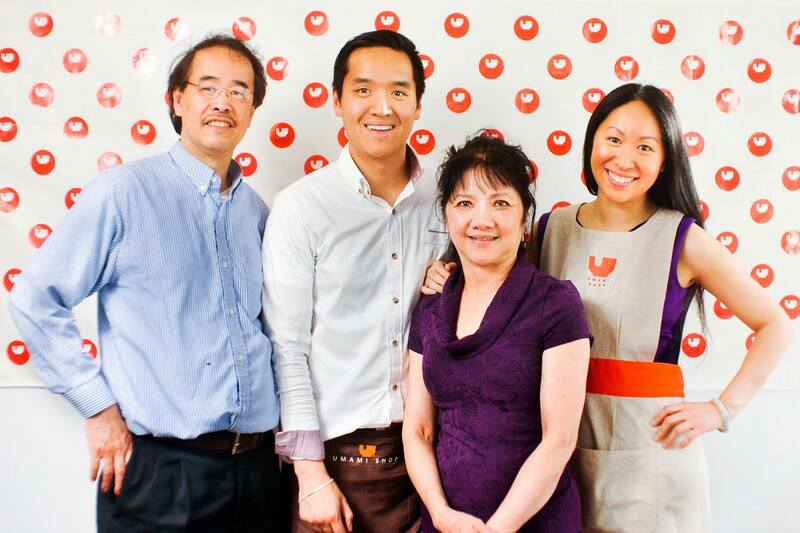 Our father Louis Luu, the owner and founder of the Asian Supermarket, along with our mother Thao; had initially opened the business solely because there was a lack of a food selection from our own country, Vietnam, back in the 1980's, where an influx of Vietnamese Boat People came to Canada and were resettled all over. We understand and believe that ethnic food is important no matter where we are: food connects and comforts individuals near and far. We are happy to continue to support the Bhutanese Community, and please feel free to let us know what other selections that are important for the Bhutanese diet. 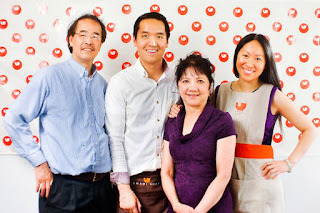 We would like to introduce a feature food and recipe blogger Brian Ly from tubbybakes.com. He currently resides in Toronto, an avid foodie and a creative food photographer for an upcoming Foodie shop in Burgundy, France. I had a sudden craving for fried rice last night and decided to stir something up. But after a long night, I thought it would be best to take a nap first…8 hours later, I woke up and the magic began. Add the ginger and garlic into the pan and get them nice and golden brown. Remove from pan. Add the scallions to the same pan. Mix in the rice with the scallions. Heat oil in a large skillet on medium to high heat. Add ginger and garlic into the pan and stir until golden brown. About 30 seconds. When it’s done, remove with a slotted spoon or tip the pan and spoon it out into a bowl lined with paper towel. Salt if desired. Turn the heat down to low and add the leek/scallions. Scallions take a couple of seconds, but the leeks will take a few minutes. Once they’re sizzling, turn the heat up and add the day old rice and break it in thoroughly. While the rice is going at it, heat another small pan and start frying the eggs. Once they’re golden around the edges, pop them out. Lay the rice on a plate and top with egg. Garnish with ginger and garlic and a bit of soy sauce. Enjoy. Tips Use day old rice. Why? You want fried rice don’t you? Using fresh rice while it’s still warm won’t give it time to release its moisture resulting in a soggy mushy rice. This isn’t a recipe for soggy mushy fried rice now is it?